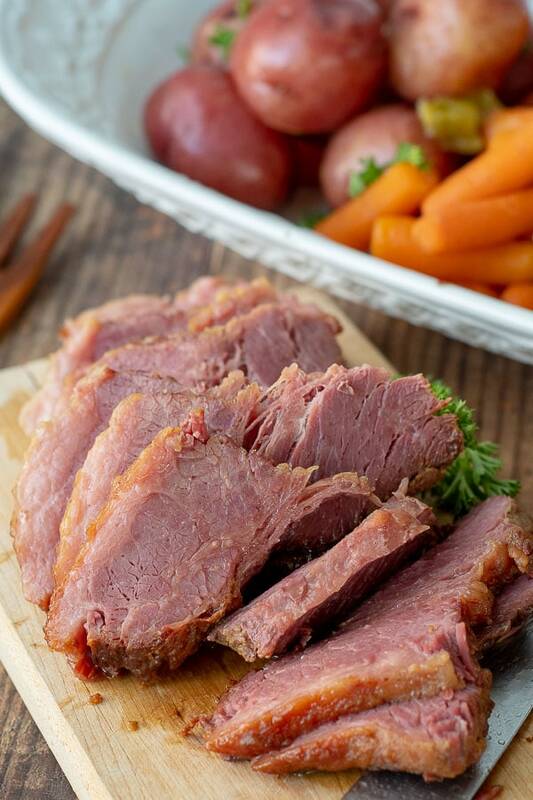 Easy Slow Cooker Corned Beef and Cabbage is hands-down the best corned beef recipe! 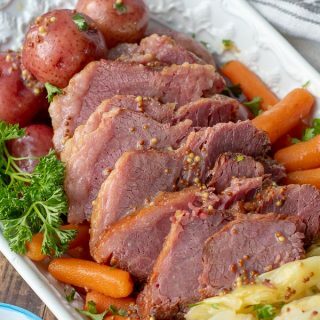 Corned Beef brisket flavored with brown sugar, mustard, and apple juice can be cooked in the crock pot or instant pot. What Makes this the Best Corned Beef Recipe? I understand claiming this to be the best corned beef recipe is quite a statement. But hear me out. People have told me time and again they’ve never enjoyed corned beef and cabbage before trying this recipe. 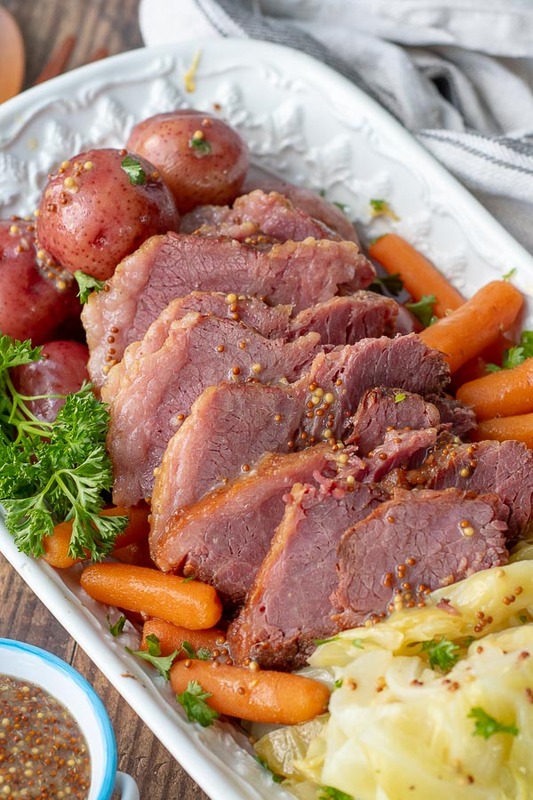 The flavors of brown sugar, apple, and mustard convert anyone on the fence about corned beef! 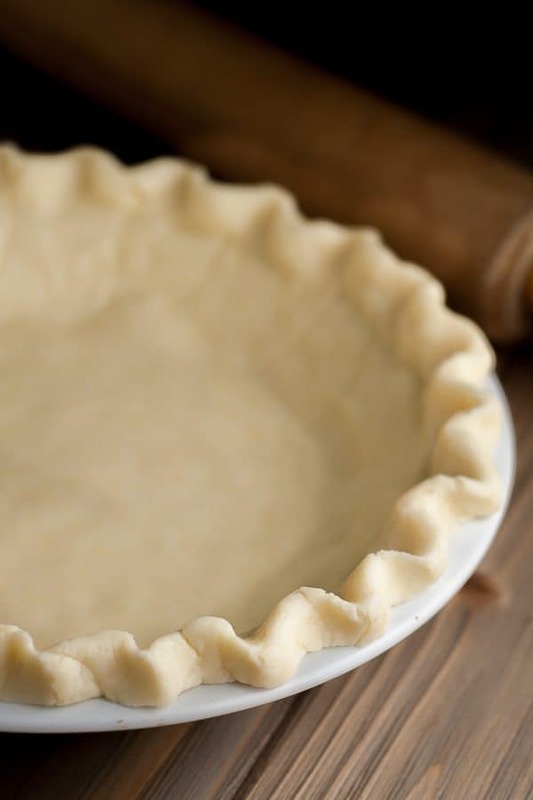 The taste makes this recipe pretty stellar, but how easy it all comes together is the icing on the cake. Simply whisk together apple juice, brown sugar, and whole grain mustard to cook the corned beef in your crock pot or pressure cooker. The brisket is moist and tender, while the cabbage, potatoes, and carrots take on an incredible sweet and savory taste. Using the slow cooker or instant pot guarantees equally delicious results, so decide depending on equipment or how much time you have. 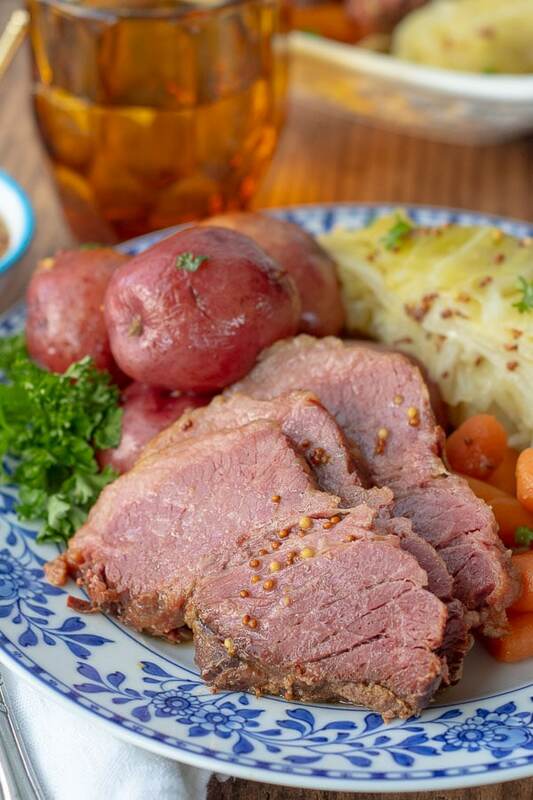 Corned beef shrinks down quite a bit during cooking, whether it’s cooked traditionally in the oven or in the slow cooker. What appears to be a large brisket in the store, can be deceiving. Figure at least 1/2 – 3/4 pound per person depending on people’s appetites. To guarantee leftovers (the best part of cooking corned beef), one pound per person is best. Should I Buy Flat Cut or Point Cut for Corned Beef and Cabbage? When purchasing corned beef there is quite a price difference between flat cut and point cut corned beef brisket. Point cut is generally much cheaper. It has more fat marbled throughout so it will fall apart easily upon cooking. Use this if you prefer shredded corned beef, which would be good in rubens or corned beef hash. Flat cut is leaner and holds up for slicing. There will still be a layer of fat on one side, but this keeps the meat moist while cooking. After cooking the excess fat can easily be removed. I always buy flat cut for Slow Cooker Corned Beef and Cabbage because it slices nicely and more of the weight is made up in meat versus fat. What is in that Corned Beef Spice Packet? For Crock Pot or Instant Pot Corned Beef and Cabbage the spice packet is sprinkled over the brisket before cooking. If the brisket doesn’t come with one you can improvise! Sprinkle one tablespoon of pickling spice over the corned beef. Or make your own seasoning by combining a crumbled bay leaf, mustard seeds, coriander seeds, allspice berries, crushed red pepper, and minced garlic. 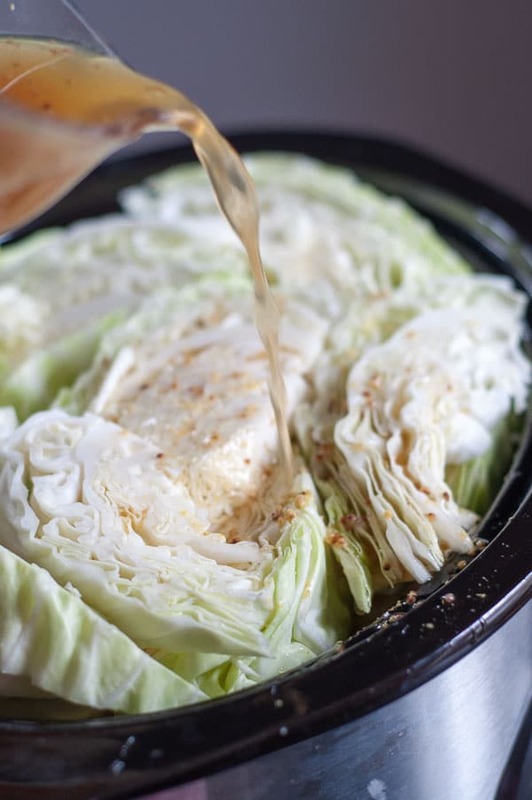 The beauty of Slow Cooker Corned Beef and Cabbage is it’s a whole easy meal in one recipe. Meat cooks right along side a delicious collection of cabbage, potatoes, and carrots. 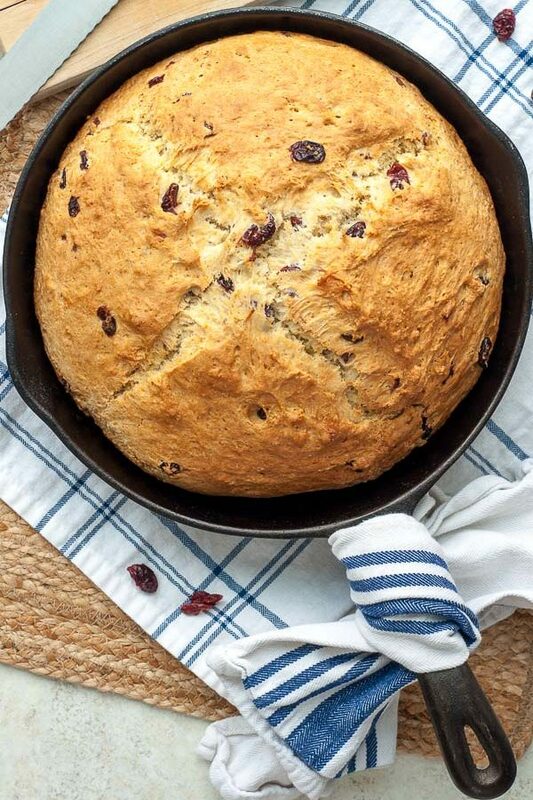 However, I have never made this meal without making the world’s best Irish Soda Bread to go along with it. I think my family would disown me if I ever tried it. 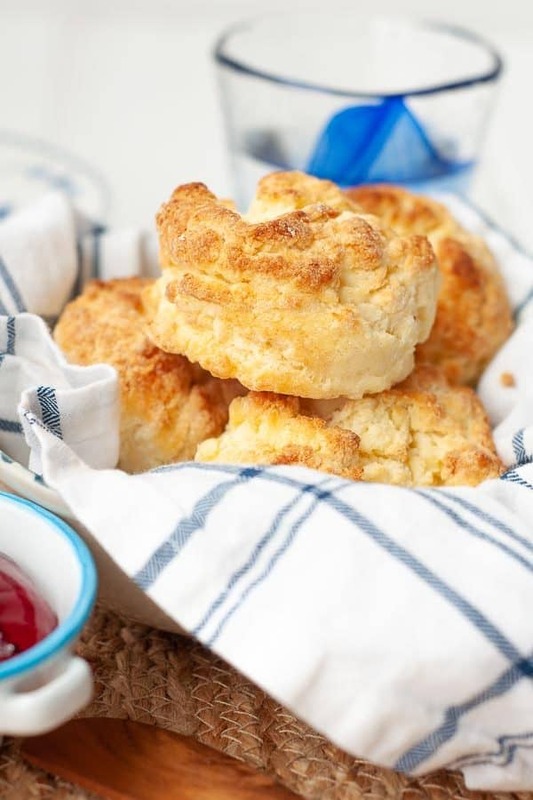 The Irish Soda Bread recipe I use was the one my mother always made. As kids, we looked forward this bread all year (way more than corned beef and cabbage). Basically we endured the meal to afford us seconds on the bread. It’s like a dessert bread with a golden, crunchy, sweet crust, moist, chewy interior, and dotted with tangy cranberries. Plus it’s easily thrown together in five minutes. Should Corned Beef Be Rinsed? I always rinse the corned beef before cooking without sacrificing any flavor. However, this seems to be a matter of preference. Some people shun rinsing away the gelatinous brine. I just find it, well, a little off putting. 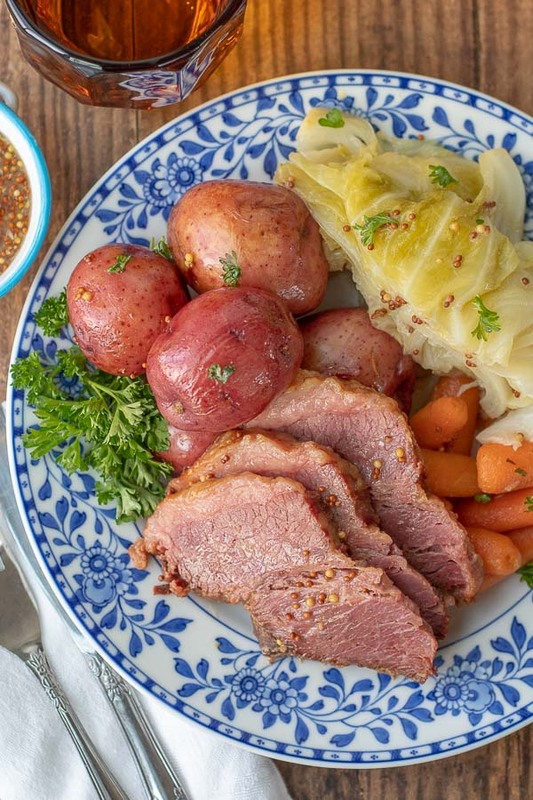 Since this corned beef recipe cooks in mustard, apple juice, brown sugar, and spices, the extraordinary flavor still shines through! The best way to reheat corned beef and cabbage is to simmer covered on the stove. Save the cooking liquid from the corned beef. Place the leftovers in a pot, pour the liquid over, bring to a boil, then cover and gently simmer until potatoes are warmed through. Place potatoes and carrots on bottom of large crock pot. Lay corned beef brisket on top and lay cabbage wedges over the top and on sides. Mix together apple juice, brown sugar, and whole grain mustard. Pour over top of everything and cook on low for 10-12 hours. In the pressure cooker pour apple juice, brown sugar, and mustard. Stir to combine. Set the rack in the instant pot and place corned beef on top. Sprinkle seasoning packet over top. Cook on HIGH for 80 minutes with a 20 minute natural release, then quick release. Remove corned beef and wrap in foil to keep warm. Remove rack. Strain the cooking liquid with a mesh strainer. Pour 1 1/2 cups of cooking liquid back into the instant pot. Place potatoes, carrots, and cabbage in the pressure cooker. Cook on HIGH for 4 minutes and then quick release. 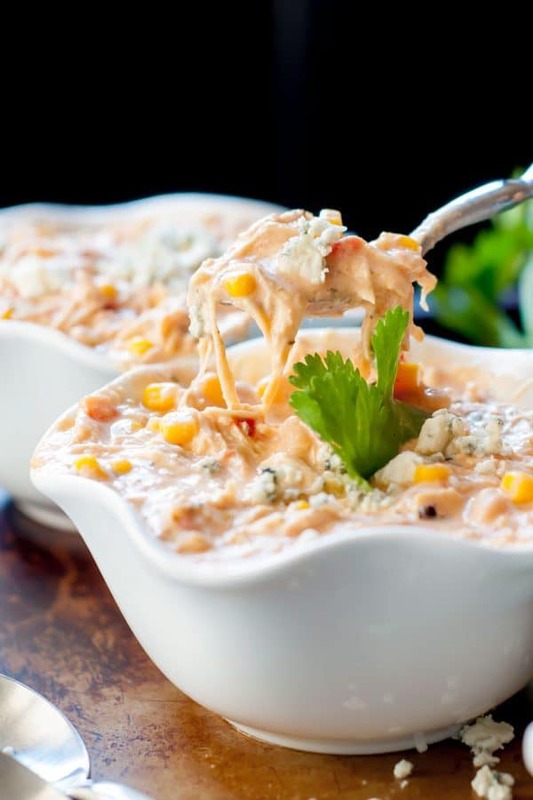 Double the recipe in two crock pots, especially if you are having company. Corned beef shrinks during cooking. Refer to post above to gauge how much corned beef to buy per person. If the lid won’t fit securely with all the cabbage, no worries. Just cover the top with foil and place the lid on top of the foil. As it cooks everything will reduce in size. 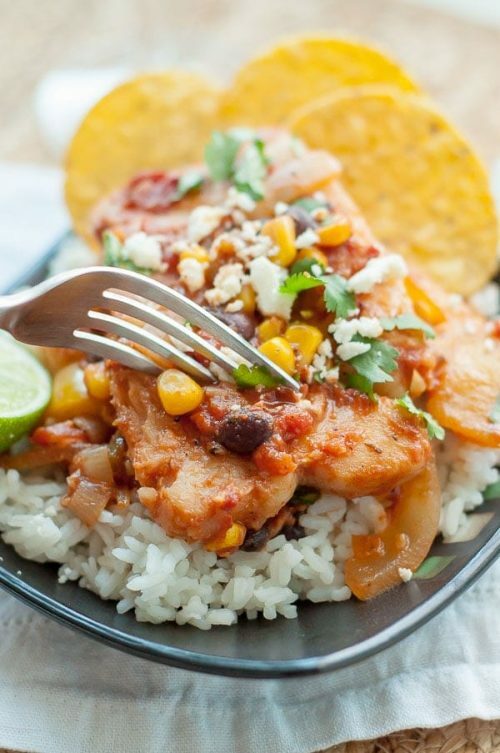 Make sure to use a large slow cooker or pressure cooker. At least a 6 quart slow cooker, or instant pot is best. If you don’t have a large enough slow cooker or instant pot, leave out the potatoes and cook them separately with this recipe. 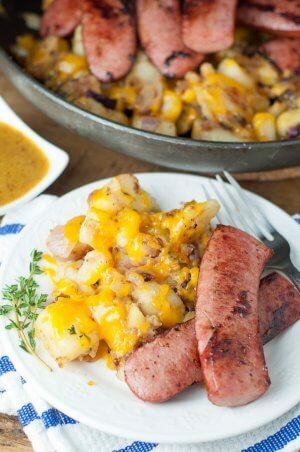 Other MamaGourmand Dishes to Make St. Patrick’s Day Complete! 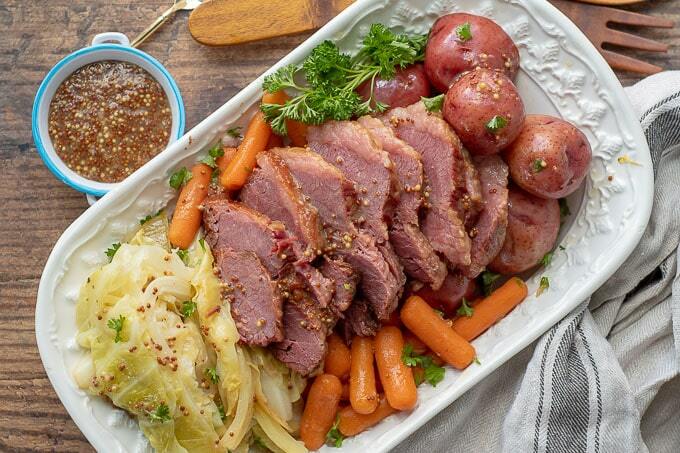 SAVE THIS Slow Cooker Corned Beef and Cabbage TO YOUR PINTEREST BOARD! 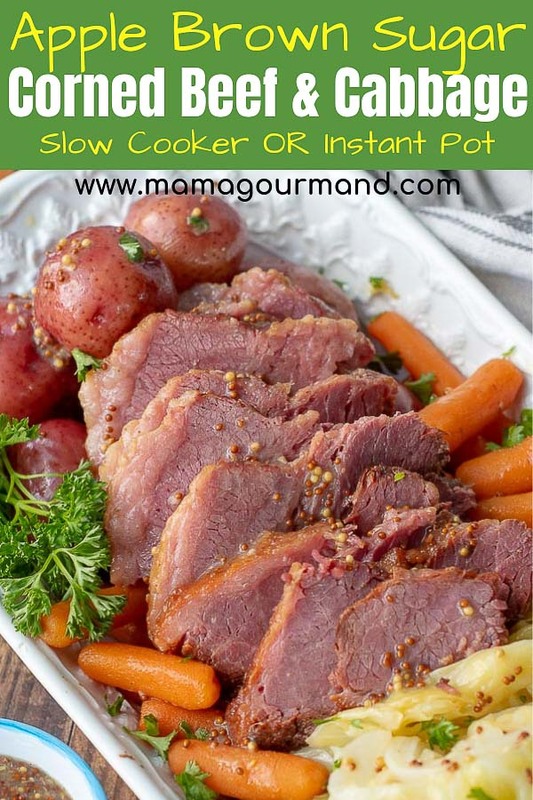 Easy Slow Cooker Corned Beef and Cabbage is the best recipe ever with brown sugar, mustard, & apple flavors and cooked in the crock pot or instant pot. Put potatoes on bottom of 6 quart slow cooker. Place carrots on top, then corned beef, fat side up. Sprinkle seasoning packet on top of corned beef. Fit cabbage wedges on top and around sides of brisket. Whisk together the apple juice, brown sugar, and mustard. Pour liquid over everything in the crock pot. Cook on low for 10-12 hours or high 5-7 hours until meat is very tender. Slice beef against the grain. Mix together (optional) mustard and butter and serve with vegetables and corned beef. Set the rack in the instant pot and place corned beef on top, fat side up. Sprinkle seasoning packet over top. Cook on HIGH for 80 minutes with a 20 minute natural release, then quick release. Remove corned beef and wrap in foil to keep warm. Remove rack. Strain the cooking liquid with a mesh strainer. Discard solids and pour 1 1/2 cups of cooking liquid back into the instant pot. Place potatoes, carrots, and cabbage in the pressure cooker. Cook on HIGH for 4 minutes and quick release. Mix together (optional) mustard and butter and serve with vegetables and corned beef. If the lid won't fit securely with all the cabbage, no worries. Just cover the top with foil and place the lid on top of the foil. As it cooks everything will reduce in size. If you don't have a large enough slow cooker or instant pot, leave out the potatoes and cook them separately with this recipe. Like most people, we would have corned beef once a year. But today, I am making this again for a second time per my husband and mother’s request (A very picky duo). 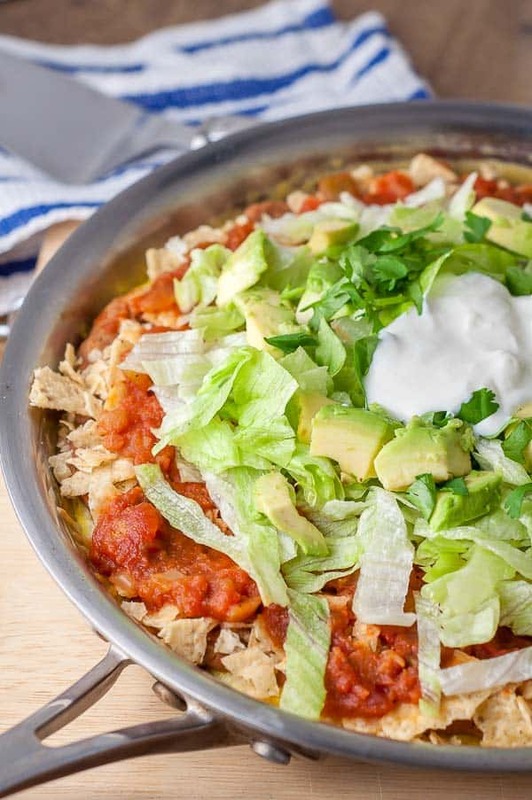 While the ingredients were not completely different from what I have used before, using my Crock-pot Express Cooker (don’t have the Instant Pot), and your method was. Melissa, this was amazing and by far the best corned beef I have ever made! You have now replaced my tried and true recipe that I have been making for years! Thank you for proving that there is always room for improvement, and that change can be rewarding! Wow, this comment really made my day. Thank you for taking time out of your day to let me know. It’s always a great feeling to find a recipe that picky eaters enjoy 😉 I do believe this about this recipe, though. It makes non-corned beef eaters true fans! Thank you this was the best. Its a once a year thing in our house so who knows how it will turn out. Moist corn beef and the veggies and potatoes not over done. Delicious. I also made the Irish Soda Bread. I am a cook but not a baker. It was so good. When I put it in the oven my husband looked at me like you are not trying to bake again, He ate half of it. Thanks again. I have made corned beef twice and I’m 43. Both times they were leather. 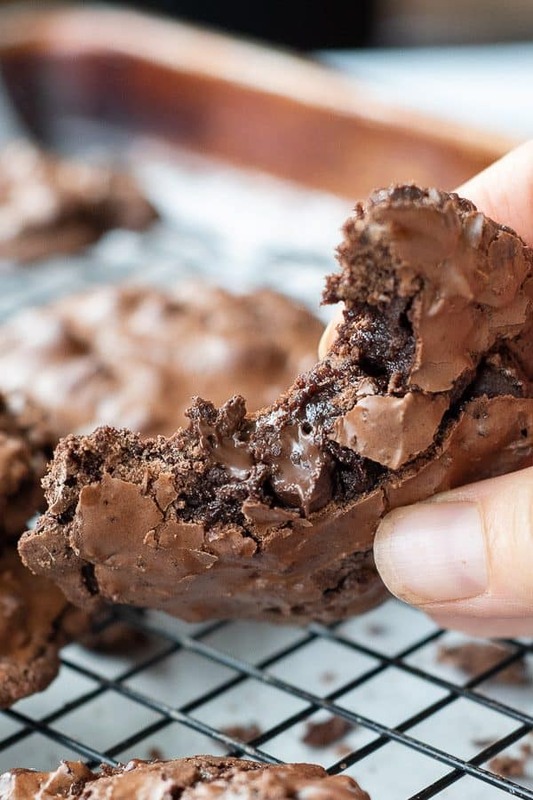 This recipe is absolutely by far the best I have ever had! My husband and son were blown away. This will be my only recipe for corned beef from now on. Thank you so much! 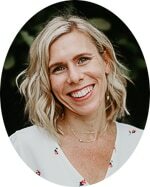 Thank you Kristin! I’m so happy this recipe was the winner for you. That makes me so happy! Should the liquid be covering the corned beef and cabbage?!? I followed this recipe today but changed the proportion of corned beef. I put 2.5 point cut and 3 lbs flat cut in the crock pot. I was a little nervous because this was my first time making corned beef in the crock pot and I wasn’t sure if the liquid should have been covering the meat…it did not. I cooked everything on high for 7hours and it came out absolutely perfect. My entire family loved it. We cooked additional pieces of corned beef the traditional way on the stove and the crockpot pieces were bar far preferred by our guests. Thank you Jessica and I truly appreciate you taking the time to let me know how it turned out for you. I’m sure that’s helpful for other readers as well, knowing you don’t have to have the liquid cover the meat. You must have had a lot of party guests! That is a lot of corned beef! Worst corned beef I’ve ever had in my life. And being New York Irish, I’ve had a lot. The flavor of the veggies was really good, but the corned beef was wicked dry. Dry and corned beef don’t belong in the same sentence! Used the slow cooker method. Will not use this recipe again. Considering how expensive corned beef is, I’m extremely disappointed and wish I had stuck to my tried and true. Wow. Something tells me you didn’t like how your corned beef turned out? I’m truly sorry it was a frustrating experience for you. I know I would be upset too if I spent all the that money and it turned out so bad. A lot of people (me for one!) don’t make corned beef very often because of the cost. I’m not sure exactly what happened for it to be so overcooked, but I do just want to say I feel you, and I’ve been there with cooking experiences before. 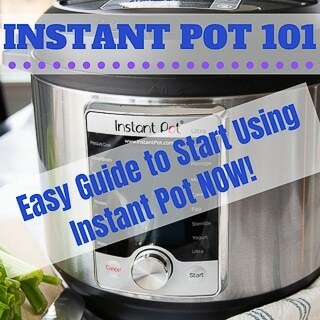 I have made your instant pot corned based recipe twice now and it is amazing!!! The whole family loves it!!! Thanks so much!!! You’re welcome! 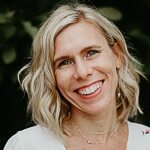 The instant pot version is something I came up with this year, and I have to say, I think i prefer it over the slow cooker. I like how the vegetables cook separate so everything is more accurately timed. Glad your family enjoys it as well, Alicia! I followed the directions to the letter in my new All-Clad, beautiful crock pot. Cooked it on low 9 hours because my cabbage was in two hours and not done. I put it in the microwave to finish up and it was still a little undercooked. I did use regular cabbage because we love it. Not sure if the Savoy cabbage would be different. Also the meat wasn’t as tender as when I cook corned beef on the stove. 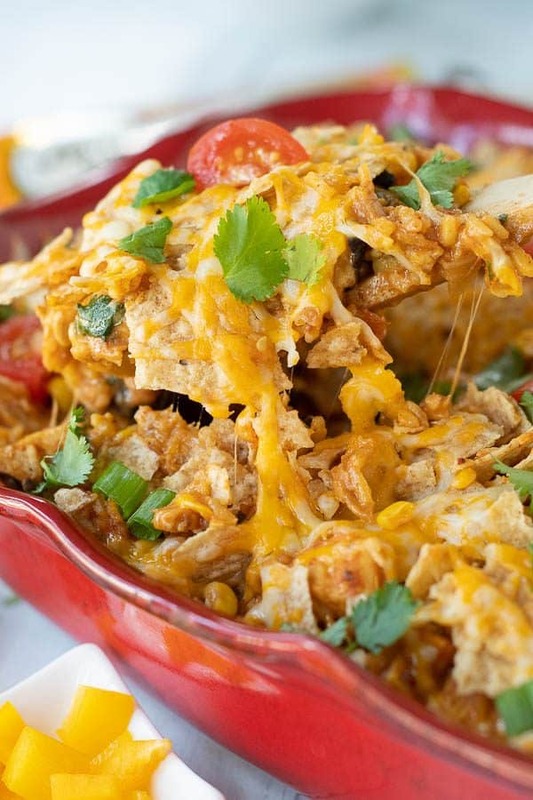 This recipe will not be made again in the crock pot. Thank you so much for writing and I’m truly sorry you had issues. The recipe says to cook on LOW for 10-12 hours, so maybe that’s why it was undercooked? I’ve made this several times this past month and the timing has worked for me. However, just as every one’s oven cooks differently, so do crockpots (which, I’m SUPER jealous of yours!). I’ve gone through some different crockpots and I always have to adjust the cooking times on them based on how hot they cook. Again, I apologize for you troubles and happy St. Patrick’s Day! Wonderful, so glad to hear it and happy you enjoyed your dinner! My family is fond of beef and so, I love to try new recipes for moist beef, but I don’t have a slow cooker. However, I’ll buy it soon. Can you tell me if I can put the frozen beef directly into the slow cooker or do I need to defrost it first? & what maximum amount of beef can be cooked in a one pot slow cooker? I don’t recommend putting frozen beef in the slow cooker for two reasons. First, this corned beef takes quite awhile to cook in the slow cooker and adding the time to thaw it first would take a few hours longer. Also, since the slow cooker cooks gradually it’s risky for the meat to stay at those in-between temps for too long. It could spoil the meat and make you sick. People do put frozen meat in the instant pot with success, though. This works because the meat is brought to a safe temperature much faster. If you have at least a 6 quart slow cooker you can fit up to a 4 pound brisket with all the veggies. Hope that helps and enjoy! I hope you love it as much as we all do. Enjoy!